Congratulations to everybody who took the ADA BTC Trade. You are looking at a weekly chart of ADABTC. Cardano, a top 20 project, is what some people believe to be an Ethereum-killer. While it has many advantages like an active development team, up-to-date activity on github and social channels it hasn’t yet gained the same traction with users Ethereum has. We like top 20 coins because of liquidity on most exchanges — after all, why get in if you can’t get out or the bid-ask spread is not tight enough? What we are seeing now is a notable change in trend as the coin has closed above it’s 30 week moving average for the first time in a year. It’s also been accompanied by increasing volume which is a needed confirmation sign. 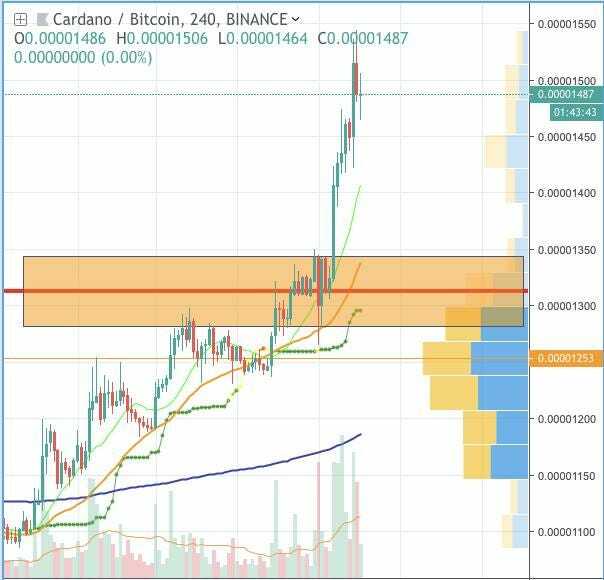 Long term traders looking to profit from Cardano in the months ahead can take a position here (1242 satoshis) and on any pullbacks up to 1150. If we close below 1150 on a weekly level - it’s time to get out. Your risk is defined to 7-8% and potential upside is somewhere around 60-80%. My kind of risk reward!